An endless parade of pizza slices make the Heroes in a Half Shell happy on this colorful and fun pair of Ninja Turtles lounge pants! 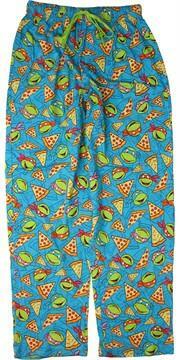 The Ninja Turtles Heads and Pizza Lounge Pants are blue with an elastic waist and green drawstring. Leonardo, Michelangelo, Raphael and Donatello from TV's Teenage Mutant Ninja Turtles are all smiles on this "shell-icious" pair of comfortable lounge pants!